Casual visits to the ING, in daytime or at night, are not possible. However, group visits by schools, amateur astronomical societies and similar parties with a particular interest in the Isaac Newton Group of Telescopes can be organised. For further information please contact the ING Public Relations Officer at the contact details given at the bottom. 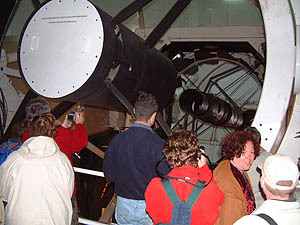 The Roque de Los Muchachos Observatory runs a regular visit programme to some of the telescopes, operation and weather permitting. For booking online and more information please check Visits to ORM, including how to get to. The Observatory site lies within the Caldera de Taburiente National Park area. You can walk and drive around the Observatory site. The Roque de Los Muchachos peak is the highest point of La Palma and from there the views of La Caldera de Taburiente National Park and La Palma are fantastic. Please follow this link maintained by the Instituto de Astrofísica de Canarias (IAC) for further information on the ORM. In the past we used to organise Open Days in summer, but not any more. 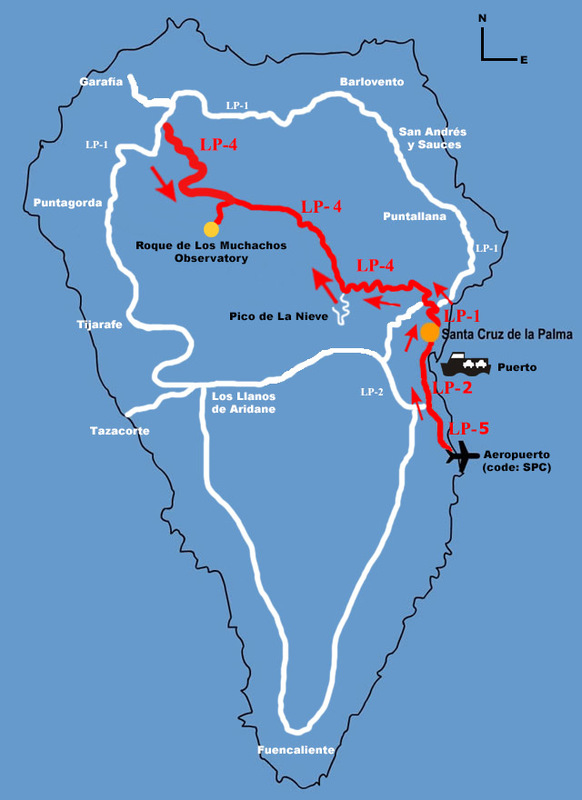 There is some useful information on how to reach La Palma in Travel to La Palma web pages for ING Visiting Observers. The access to the Observatory through Santa Cruz de La Palma is an asphalting mountain road 40 km long (or 20 km if you take the Northern access from Garafía). 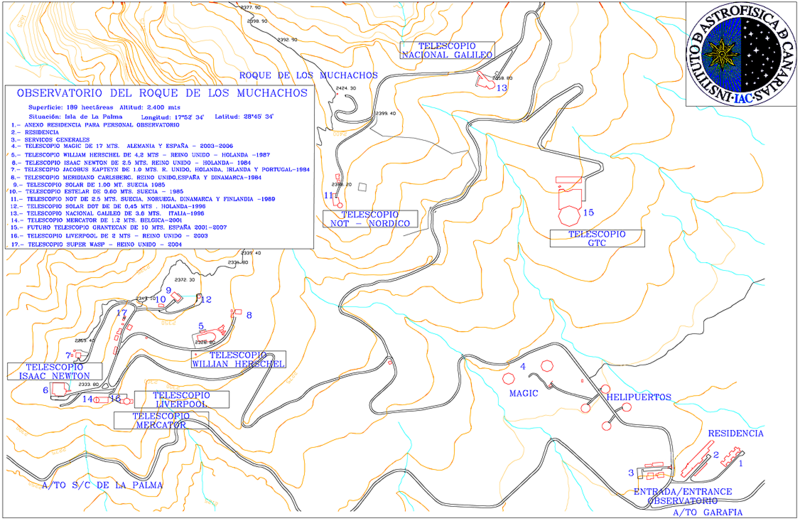 This map of La Palma shows the route to the Observatory from the airport and the harbour. There is no public transport to the Observatory. At both the airport and the harbour you can take a taxi or hire a car. The reception of the Observatory's residence (the "Residencia" in Spanish) is the usual meeting point and the start of the tours. This observatory map shows the location of the telescopes and the residence. A more detailed map of the observatory is also available. photo 1, photo 2. It's very important that you check the current conditions at the observatory, and confirm with your guide, visit organiser or residence's receptionist that everything is ok and it is safe to travel to the Roque de Los Muchachos Observatory before leaving. Please be aware that weather, road condition or even operational reasons could prevent you to visit our telescopes and last-minute cancellations could be made. Weather may change rapidly, and in particular in winter. Please be aware of strong winds, slippery roads, and the risk of falling ice close to the buildings. The altitude of the observatory is 2400 meters which translates into in a mountain environment. For this reason, people of weak health should not travel to the mountain. Low pressure can result in breathing difficulties. There is generally no professional medical assistance on the mountain. The intensity of the solar radiation is higher than at sea-level. Visitors must avoid continuous exposure to the sun and protect themselves with a solar-protector and a cap. Children under 12 years-old must be accompanied by a tutor all the time. Please stay away from observatory's equipment. Do not drink water from the faucets. The Observatory does not offer transportation for visitors. The drive from Santa Cruz de La Palma takes approximately 1.5 hours. Please check the weather and road conditions before leaving by contacting the residence's reception (+34 922 405 500) and drive very carefully. If you are driving alone please inform someone else of your plans. You are welcome to bring a light snack or lunch. There are no facilities on-site that offer meals. Please wear appropriate clothing such as pants, walking shoes (no sandals), sunglasses, etc. We recommend a light jacket/sweater for the domes even in summer. ING permits photographs and video taping during the tours. During your visit, please stay with the guide all the time. Below you will find useful information related to your visit. We recommend having a look at these web pages before the visit takes place. Public information on the Isaac Newton Group of Telescopes. The Planning Observations web pages for visiting astronomers contain plenty of useful information on accommodation, transport, etc. The ING Weather Station is the central source of all information concerning the weather conditions on site, including up to the minute measurements of meterological data, weather maps, forecasts and archived data. La Palma climatic information can be found in the climate of La Palma web pages. The ING La Palma web pages summarise some practical and touristical information on La Palma. From time to time we are honoured to show around polititians, nobel prizes, astronauts... Find out who visited the ING. The Isaac Newton Group of Telescopes has joined other institutions on site to bring astronomy outreach to the schools on La Palma island collaborating with Nuestros Alumnos y el Roque de Los Muchachos programme. For schoolchildren and students coming from abroad, and in particular, from UK and The Netherlands, ING can offer some special arrangements. Find out more about this interesting experience in schoolchildren and students visiting ING.